Would you do anything for an Oreo? Many are proving that they would in the brand's new collaboration with beauty bloggers. Read more about this campaign and other industry news in this week's Inbound Marketing Highlights. Looking to try something new, Oreo decided to take advantage of the current beauty blogger craze. 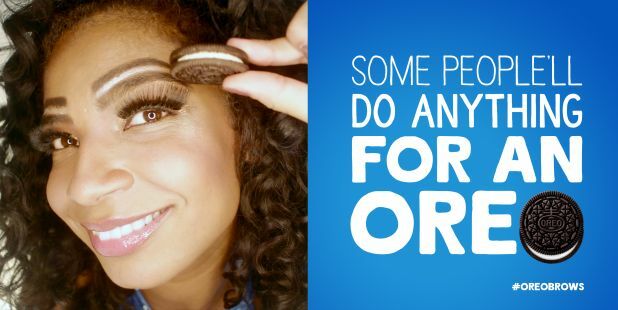 As part of their ‘Some People’ll Do Anything For An Oreo’ campaign, they have unleashed influencers to draw oreo inspired eyebrows. The Oreobrow is basically your own eyebrow with a dark line drawn over it, and a white line in between. The campaign features many models rocking the three-layer look– in homage to the eyebrow obsession that’s dominating the beauty industry. Oreo is one of many brands to unleash a team of influencers this year. Facebook Ad spending took a big hit after the Cambridge Analytica scandal earlier this year. However, it seems to be back up with $120,000 being invested in August alone. But while advertisers may be returning, some of the social network’s users have not, with trust still dwindling in the platform. ROI in Facebook Ads has also not yet recovered. Facebook advertising decreased from an index value of 2 in April to below 0.5 in August. One of the ways brands are getting found by consumers these days is through search engine results, both boosted and organic. This, however, can be difficult if your brand is using the wrong keywords, or spreading themselves to thin by using too many keywords. Gap who was boosting nearly 1,000 keywords earlier this year, has cut them down by 95%. While their top performing keywords were all brand terms like, “gap,” “athlete,” “gap com,” “old navy com” and “www.oldnavy.com,” the brand continued to pay for non-brand terms like, “denim dress” and “women’s suits.” Earlier their click share rate was the lowest of all major retailer brands, at a measly 0.1%. They have bounced back to over 4% since then. So you have a smart home thanks to your favorite voice assistant device, but are you using the same technology in your car? Now thanks to Amazon, this is easier than ever. Thursday, Amazon HQ announced a whole new line of Echo products, which will further integrate this technology into the customer’s lives. This expansion will give marketers new opportunities to reach customers at every point of their day-to-day routine. This announcement is coming soon after Nissan partnered with Google to create in-car voice technology. Amazon’s competing device will be called the Echo Auto, an eight-microphone speaker that connects via 12V outlets or USB power in your vehicle. How can Digital Brands Use Haptic Marketing? Many marketers are unfamiliar with haptic marketing, a relatively new discipline that focuses on the use of tactile sensations to influence purchasing. The idea behind this concept goes back to when shopping was primarily done in person. We felt fabrics, tried on clothes, pushed buttons. Touch is proven to increase purchase intent and confidence in the product. But now that e-commerce is on the rise, how can we utilize haptic measures? Brands have been testing a few different ways to replicate this experience digitally. Retailers like Macy’s, ASOS and Nordstrom are trying to recreate the “dressing room experience” by offering free delivery and returns, allowing buyers to try on items in their home risk-free. Video is another way to highlight the way an object feels. But instead of doing a simple 360-degree video, you can have a model touch the product and react to it positively.